Portrait of a flamenco dancer. Gauche painting on canvas by Spanish artist Cortés Matas. Although little is known about artist Cortés Matas, the Internet has the unique power to bring together rumors, facts and conjecture. When Michael Aaron Gallagher acquired the mysterious portrait of a beautiful woman, all he knew was that it was an old gauche painting on canvas with noticeable signs of craquelure due to travel and age. The rusted nails used to secure the canvas to the stretcher, likely indicate that it was produced pre-1940, when the invention of staples made them the preferred choice for securing the edges of canvases. After scouring the internet, he was able to piece together what may or may not be the true origin of the painting. From the accounts he read, Cortés Matas was a Spanish artist, who lived in Madrid. For decades, he sold his works to tourists and military personnel, many of whom were stationed overseas, before they eventually returned with the art to the United States. He often signed his work “Cortes” or “Cortes Matas,” including the copies of other paintings he produced. 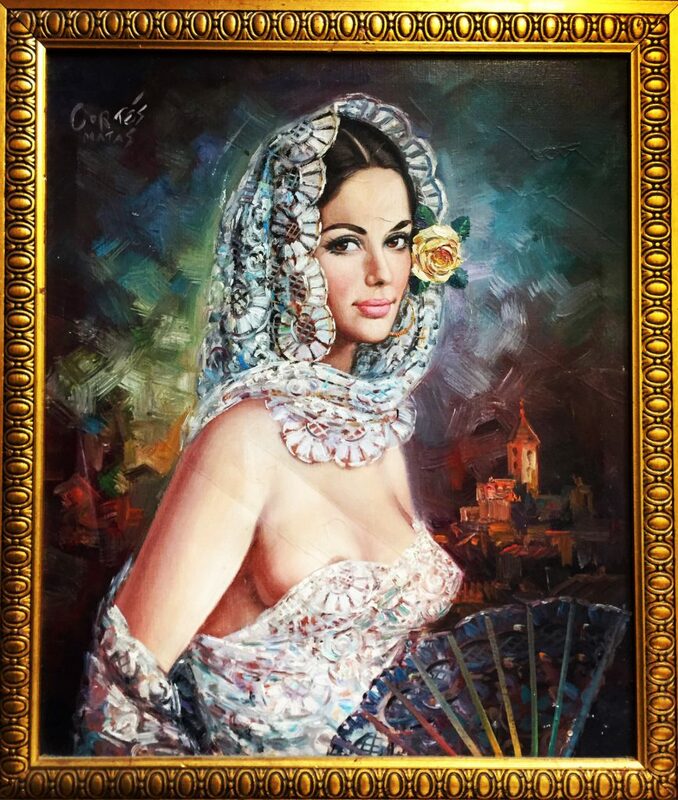 It is said that he used his beautiful wife, who was a flamenco dancer, as a model for many of his pieces. From sensual portraits of voluptuous women, to matadors dressed in their traje de luces, his art was both timeless and unforgettable. Yet in spite of his commercial success as an artist and his compelling subjects, Cortés Matas never quite achieved the notoriety that his talent deserved.